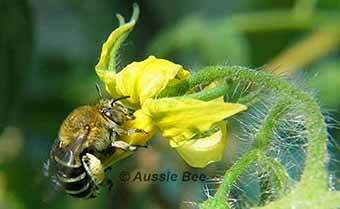 Dr Katja Hogendoorn of the University of Adelaide worked for six years on developing native blue banded bees for greenhouse tomato pollination. Her goal was that our growers would be able to pollinate their crops with blue banded bees; instead of manually pollinating their crops or importing European bumblebees into Australia. -- Blue banded bees are solitary native bees that normally only breed and fly in the summer months. However, Katja developed methods of making blue banded bees breed and fly all year round. -- The nests of blue banded bees are prone to a fungus called chalkbrood that is lethal to the developing larvae. However, Katja developed hygienic techniques that kept chalkbrood outbreaks under control. K. Hogendoorn, F Bartholomaeus and MA Keller (2010) Chemical and Sensory Comparison of Tomatoes Pollinated by Bees and by a Pollination Wand. Journal of Economic Entomology 103(4): 1286-1292. -- Importantly, greenhouse designs used in Australia would need to be changed to suit blue banded bees. Most designs have vents that allow the bees to escape. Others have screens that close on hot days and bees become trapped above these screens. -- As the bees do not take pollen from a dish, the populations need to be maintained over summer in commercial greenhouses. This means that insecticide use would need to be changed, to allow the blue banded bees to breed. -- Furthermore, to supply the industry in winter requires a large breeding area. Katja's work was funded by the Australian Research Council. In addition Katja received some financial support in 2004 - 2006 from three large greenhouse tomato growers (P'petual, Flavorite and International Hydroponics), and from Timbercorp and marketing organisation Perfection Fresh in 2007 - 2009. Furthermore, Biological Services provided significant and invaluable support (both financial and practical) to the project throughout its course. Unfortunately funding for the project ceased at the end of 2009 and, due to the obstacles mentioned, it has not led to commercial implementation. This seems disappointing, but it has to be remembered that the research needed to make these solitary bees work inside a greenhouse covers a large range of issues. The development of the breeding program for bumblebees in Europe took twenty years and involved multiple research groups. In contrast, Katja's work on the blue banded bees was only funded for six years and she was only assisted by a single half-time technician. 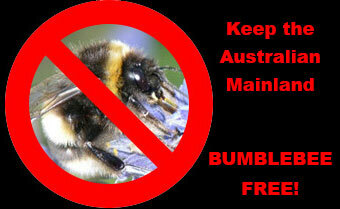 An application by horticulturalists to import European bumblebees into Australia for greenhouse tomato pollination was rejected by the Australian Government in 2008. The Environment Minister said these exotic bees "could have posed a serious risk to the Australian environment, native bee populations and native bird species." So greenhouse tomato growers will have to continue to pollinate their tomatoes manually using vibrating wand tools. -- The fresh tomato industry should become a levy paying industry. This would allow them to fund and endorse research and development that is valuable to the industry as a whole, and to give any research project the critical mass it needs. -- The industry also needs to weigh up the costs and benefits of bee-proofing their greenhouses. There would be initial investment costs for this and increased maintenance costs. The greenhouses would also need to be cooled during summer. Growers need to assess whether, from a business point of view, investment in alternative pollinators in the greenhouse is feasible and worthwhile. -- If the enterprise seems worthwhile from a financial point of view, then development of blue banded bees as greenhouse pollinators is a possibility and requires a concerted effort by the industry. Katja Hogendoorn, Zeta Steen and Michael P Schwarz (2000) Native Australian carpenter bees as a potential alternative to introducing bumble bees for tomato pollination in greenhouses. Journal of Apicultural Research 39: 67-74. Katja Hogendoorn, Faerlie Bartholomaeus and Michael A Keller (2010) Chemical and sensory comparison of tomatoes pollinated by bees and by a pollination wand. Journal of Economic Entomology 103(4): 1286-1292.